New mid-Winter 2017 Wallcovering Collections! FOUR NEW 2017 WALLPAPER COLLECTIONS ARRIVE AT UPPER VILLAGE PAINT & WALLPAPER! Every month, new collections are added to our Wallpaper Book library. 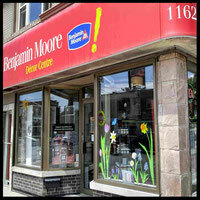 Visit us as 1162 Eglinton Ave W to see the exciting new arrivals and view the whole collection. Most books are available for 48-hour loan. Each month, we'll preview the new collections here on our blog, Upper Village Life. UPPER VILLAGE PAINT & WALLPAPER Manager Judith looks at the new arrivals. Come visit Upper Village Paint & Wallpaper (1162 Eglinton Ave W) to see the mica and metallic highlights that bring a deluxe feel to this collection. 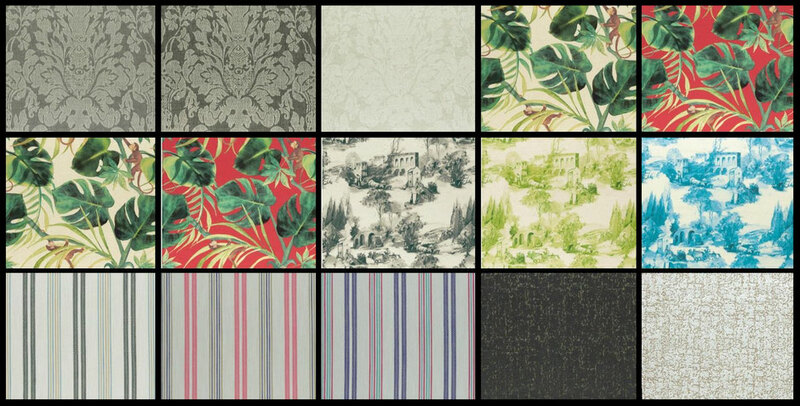 Pineapple, harlequin, stripe and trellis designs feature in this lively range of non-woven wallpapers. Available in nine designs as a paste-the-wall product. The COLONY collection features vibrant choices for statement walls. Wallpaper books are available for loan (48 hours). About Clarke & Clarke: Based in rural Cheshire, the dedicated design studio releases vibrant, fashion-led fabrics and wallcoverings throughout the year, ensuring that Clarke & Clarke collections are always on trend in both design and colour. Clarke & Clarke’s creative vision and global business success stems from the partnership of husband and wife team, Lee and Emma Clarke. Founded in 1999, the company now distributes fabrics and wallcoverings to over 90 countries and has developed a reputation for excellent quality, innovation and customer service. WHITE ON WHITE features 27” Type II Vinyl embossed to create the appearance of a natural paper weave and offered in a variety of colour as a plain or printed with a simple yet timeless trellis. Wallpaper books are available for loan (48 hours). 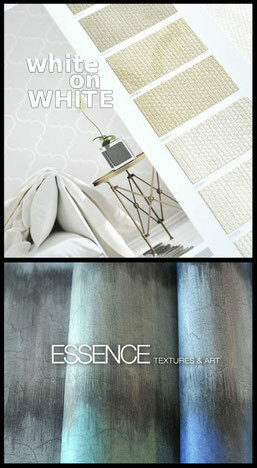 ESSENCE carefully curates Canvas Art and Wallcoverings for the home. Extraordinary design elevated by art. Wallpaper books are available for loan (48 hours). About WallQuest: The Lafoy family of Lyon, France have been involved with wallpaper since the 1820's. Today WallQuest is one of the most innovative wallpaper manufacturers in the world. Quality, colour and design, product innovation and unwavering dedication to tradition have earned the company a respected place in the global home furnishings sector. Its products are made in the United States and sold in more than sixty countries. The company is family owned and operated just like Henry Lafoy would have liked. Among its many treasures, Mercury features tasteful damasks, creamy textures, dramatic blue trellises and rustic grey stripes. Wallpaper books are available for loan (48 hours). 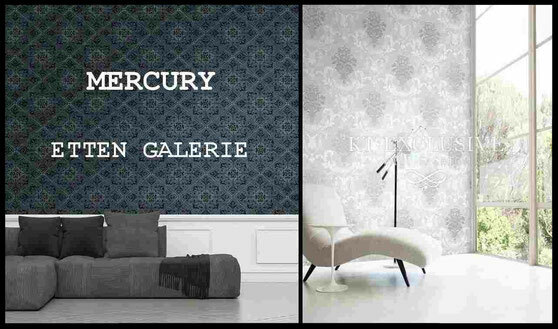 About Etten Galerie: Etten Gallerie is a relatively new wallcovering brand from the Netherlands. Their designers and printers have developed a signature series of fine printed wallpaper collections. 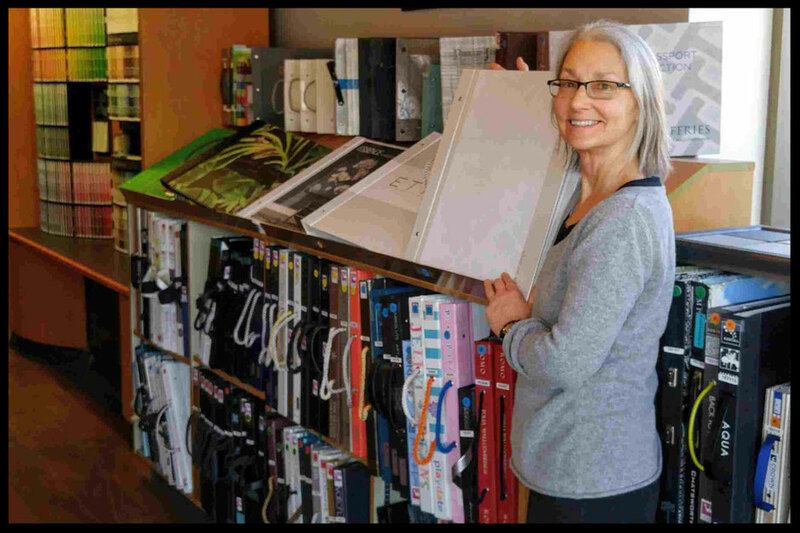 They pride themselves on exploring new printing techniques and using state of the art environmentally conscious materials. The Etten Galerie design 'look' is a subtle blend of texture and dimension.